Get your daily veges in with this delicious salad! Most of us could do with eating more vegetables and this warming roasted vegetable salad is a tasty way to do so! With a great mix of vegetables, you can nourish your body with a host of vitamins and minerals including potassium, folate, iron and vitamins A, C and B6. Carrots and capsicum are also high in antioxidants to help remove free radicals from your body while the pine nuts add a bit of protein and healthy fat. 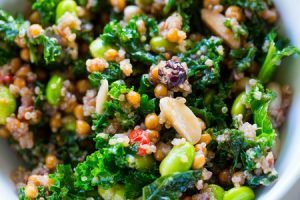 The low GI and high fibre carbohydrates in this salad will give you long lasting energy and keep you full. Enjoy hot or cold and serve alongside a piece of grilled, lean meat for added protein. Combine kumara, eggplant, carrot and onion in a bowl with garlic, rosemary, cayenne pepper and olive oil and toss well to combine. Spread out vegetable mixture on a baking tray and roast for 15 minutes or until just soft. 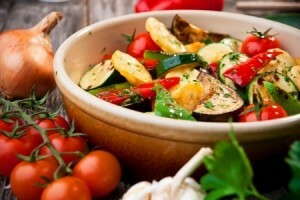 Add zucchini and capsicum to the baking vegetables, stirring to coat in oil and spices. Return to the oven and continue to cook for a further 15 minutes. Add the pine nuts and bake for a final 5 minutes, until browned. Place the roasted vegetables in a bowl and gently stir in spinach leaves and season to taste.